If you haven’t read my last post regarding the genesis of this deck, check it out here). In anticipation of a more aggro-heavy format, I went back to the Punishing/Grove combo, and also added Tarmogoyf back into the deck. While it doesn’t fit the instant-speed theme, it seems necessary for both early defense and added pressure. One of the things I found was that the deck wasn’t enough of a draw-go control deck to sit back and pick away at an opponent’s life total with a 1- or 2-power dude. Tarmogoyf fills the role nicely. Another massive hole in the previous version was the lack of card draw. The Ninjas and their curiosity were great when they worked, but they weren’t reliable enough to provide the card advantage/selection that I found myself craving in many of my games. In a word: Cute. Thirst for Knowledge is making a noticeable impact in the games where I’ve seen it. While I’m discarding 2 cards far more often than I’m dumping an artifact, it hasn’t really been a problem (due in part to Snapcaster Mage, who can get use out of any instants or sorceries you decide to dump). 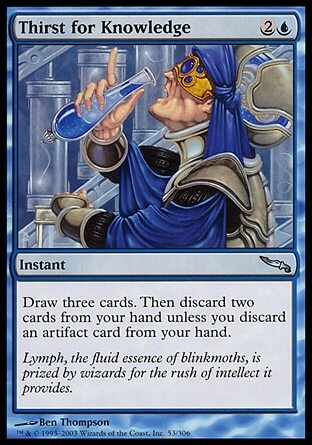 One of my favorite “tricks” is to use Thirst mid-combat as a pseudo-pump spell for Tarmogoyf. They rarely see that one coming. Obviously, these changes demanded some casualties from the previous version. I’m still loving the miser’s Familiar’s Ruse, so for the moment it’s staying. The 2 Ninjas, Venser, and a Vendilion Clique all bowed out to make room for 4 Tarmogoyf. The artifact count has been reduced to just one of each (although I’m likely including more in the sideboard), and a land was cut to make room for 6 more instants (3 each of both Punishing Fire and Thirst for Knowledge). I noticed I kept getting flooded, and since the deck can run reasonably well off just 4 lands, I felt safe doing this. With that in mind, however, I shaved the 4th Cryptic Command, which made room for the aforementioned miser’s Familiar’s Ruse. 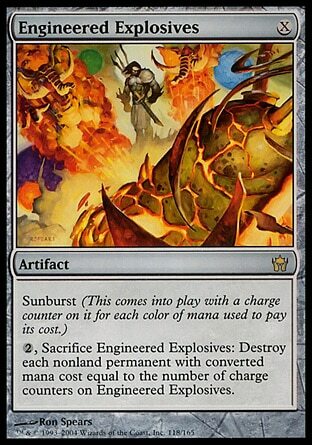 The addition of both Tarmogoyf and Punishing Fire required a reworking of the manabase. The new color requirements meant that the 4th Mutavault was the first to go. I considered cutting the Academy Ruins, but having cut down to just one of each artifact, in addition to newcomer Thirst for Knowledge, I’ve kept it in for now. Watery Grave seemed unnecessary (I don’t think I ever needed black mana, not even once). Further updates to come. In the meantime, keep an eye on my Twitter account (@AffinityForBlue), as I’ll be tweeting from Worlds this week. You can also expect some content on Episode 87 of Yo! MTG Taps! (coming up after Thanksgiving). When Snapcaster Mage was previewed at Pro Tour Philadelphia earlier this month, it was the talk of the tournament floor. Personally, I was excited to fit it into as many decks as possible. I already had Modern on the mind (it being the format of the Pro Tour), so the wheels were immediately turning in that direction. I was already testing a Previous Level Blue style deck with the Punishing Fire + Grove of the Burnwillows combo, but was somewhat unimpressed. The manabase felt clunky, and the Punishing/Grove combo was not as strong as I’d expected. Not to mention the fact that the deck was clearly too slow for the then-current environment, which was saturated with blazingly fast combo decks that made it difficult for a control deck to thrive. The bannings announced on September 20 changed all that. 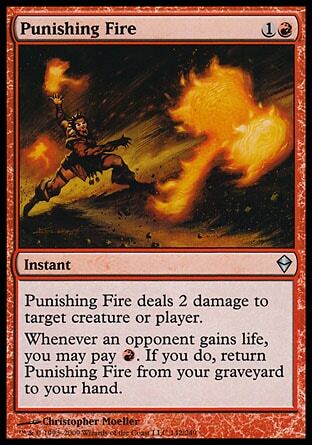 The loss of a key accelerant (Rite of Flame) plus the two best one-mana cantrips in the format (Preordain, Ponder) should significantly slow things down, providing an opportunity for control to get a grip on the format. I decided to dismantle the deck I was testing and start from scratch, using various Previous Level Blue decks and Mystical Teachings decks as inspiration. Here’s what I ended up with. The result leans towards Aggro-Control, something like a pre-Bitterblossom Faeries deck (did those even exist? Sure they did. Just ask Zvi). The amount of synergy in this deck is somewhat staggering. Not only are the individual cards powerful on their own, they work together to provide quite a bit of versatility. This is my kind of deck. Of the 35 non-lands in the deck, 27 of them can be cast at instant speed (or pseudo-instant speed in the case of Ninja of the Deep Hours‘ mid-combat ninjutsu ability); hence the name, “Flash Delirium” (the name of one of my favorite MGMT songs). 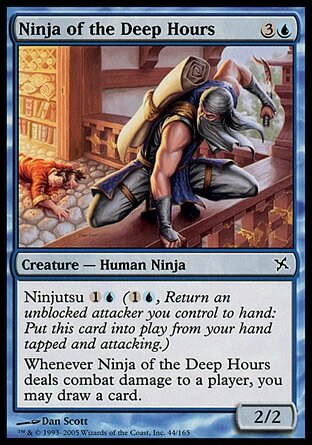 Speaking of Ninja of the Deep Hours, its inclusion may seem questionable, but it fuels one of the trickiest (and, frankly, coolest) interactions in the deck. With so many flash creatures with enter-the-battlefield abilities, Ninja acts as a one-use Riptide Laboratory that draws you a card (sometimes more than one) and allows you to return and reuse any of the other 11 creatures. Value! For the moment I’m going with the Ninja, but another idea I had (which doesn’t have to be mutually exclusive) is to play a copy or two of Familiar’s Ruse, which gives you a similar effect without the need to attack. 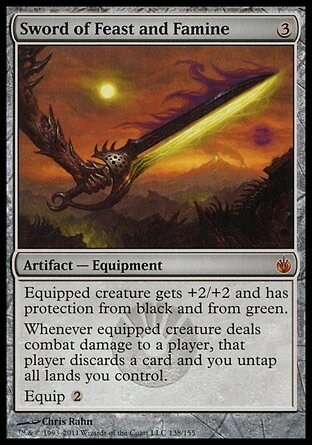 Moving on to the sorcery speed portion of the deck, Sword of Feast and Famine should be no surprise to anyone. With this many instant speed options, the deck is able to fully capitalize on the Sword’s untap trigger, while the protection the Sword offers can facilitate ninjutsu in a pinch, or help a Ninja slip by and draw you a card. The manabase is built to take full advantage of both Vedalken Shackles and Engineered Explosives. Nearly every land is an island (or can fetch one), ensuring that the Shackles fit any creature you might encounter. 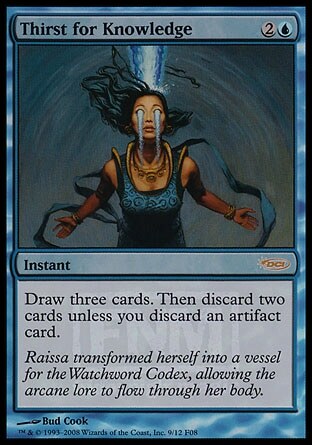 The inclusion of all four blue Ravnica-block dual lands allows you to go to the full 5 Sunburst counters if necessary. 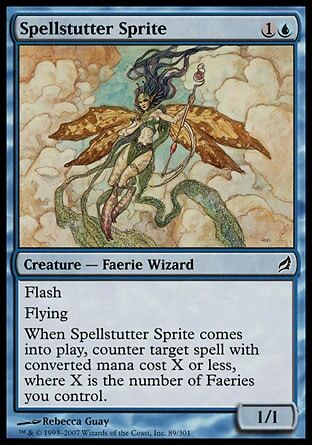 Mutavault, while not an island, is a faerie, which can be relevant alongside Spellstutter Sprite (as anyone who plays Legacy or who played Standard when Lorwyn was legal will tell you). Lastly, Academy Ruins is there to pick up any broken Swords, Shackles, or dead Explosives that might have found their way into the graveyard. This is still a rough and somewhat untested list, but it’s what I’m currently working with. 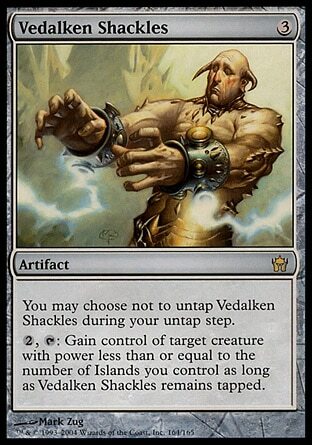 I haven’t yet come up with a sideboard (it sort of depends on how the format shapes up), but I’ve got my eye on the usual players: Thoughtseize; Krosan Grip; Pithing Needle (and possibly Trinket Mage to fetch it; can also grab Explosives); Wrath of God; Lightning Bolt (or possibly Helix, but it might be a stretch). I’m also considering an Elspeth, Knight-Errant or two. Thoughts? Ideas? I’d love to hear ’em. Follow me on Twitter @affinityforblue. UPDATE: A lot of people have been asking about the list, and while it is my intention to write up a full post after some more testing, I figured I’d throw out a few updates. After discussing the idea with Mike Flores, we both determined that the deck is likely lacking two things: more power/pressure, and probably more card draw as well. I’ve shaved some numbers, cut the Ninjas from the deck entirely, and added Tarmogoyf and the Punishing/Grove combo back into the deck (as Shaheen Soorani pointed out in his recent article on SCG, the format is looking fairly aggro-heavy). I’m currently playing with 2 copies of Familiar’s Ruse as well, which has been stellar. Next on my agenda is to get a few copies of Thirst for Knowledge into the deck. 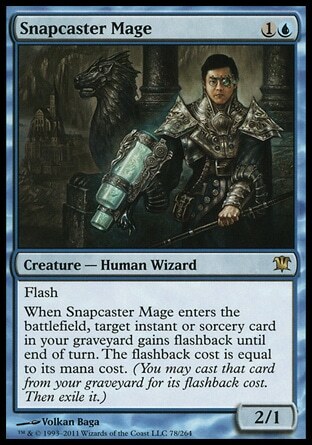 Theoretically, Snapcaster Mage will mitigate the downside of discarding spells off of a Thirst. I’m considering shaving a land, because it feels like the deck gets a little flooded more often than I’d like. More details to come.